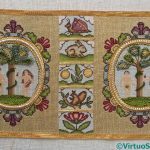 I have had a look at my progress on the projects I listed for the challenge run last year by Meredithe (Pomegranate and Chintz) and Anne (Frayed At The Edge) – 17 UFOs in 2017. In most cases, I didn’t even look at the projects, in spite of my very best efforts. In my defense, when I made the list, the projects for the Head of Nefertiti, Akhenaten, and my two little Amarna Princesses hadn’t even occurred to me, and they completely distracted me! Their project for this year – “6 and 6 in 2018” takes this possibility into account, allowing for reports on six old, or at least long-running, projects, and six brand new ones which pop up out of nowhere. I can’t be the only one who gets completely taken over by new ideas! 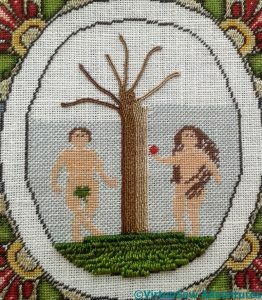 1 Eve in the Garden of Eden – all I need to do here (all!!!) is to make the box. At the moment the fabric is pinned out to straighten it a bit. I think I can call this “substantial progress”! 2 Nefertiti Shawl – I’ve recently written about the headache that this has given me. I need to get all my silks out again, and think hard about the next stage. I think I may have the faintest hint of an idea for it, but as I say, that needs much more thought. 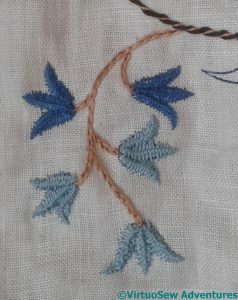 3 Queen Anne style teacloth – I got something done on this when we had a bit of a heatwave, and I’ve worked out the stitches for the Blue Flower. I just haven’t done all of them yet. “Progress”, but not “substantial progress”, I think! 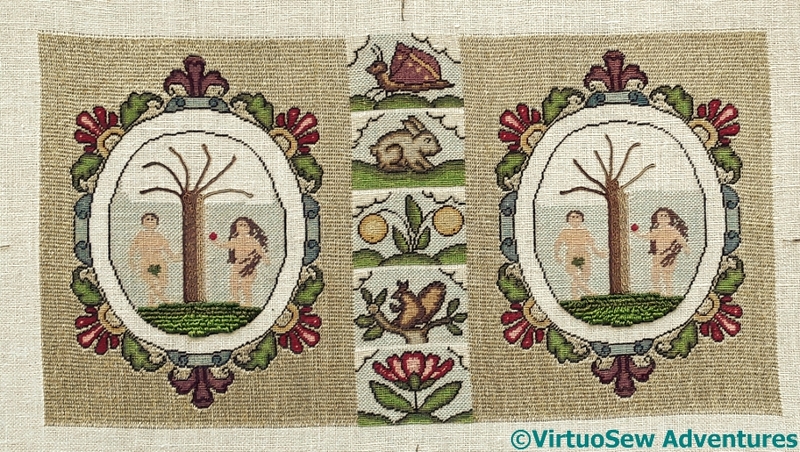 4 The Modern Stitch-Off – I think I will decide that this is finished, but I reserve the right to change my mind! 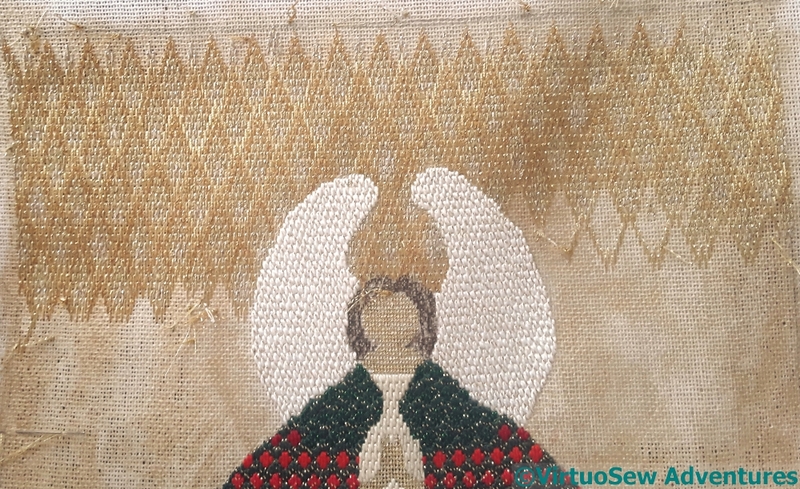 5 The Christmas Angel – I made a good start on the background, but there is a good deal more to do – again, “Progress”, but not “substantial progress”. 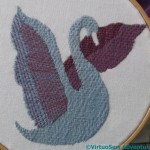 7 The Swan – not a stitch! 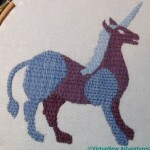 8 The Unicorn – not a stitch! I think it is fair to say that since I was ambushed by some wildly exciting ideas, it’s scarcely surprising that my attempts to finish other projects fell somewhat by the wayside. It was a nice idea, and I’m glad that Meredithe and Anne came up with it, but we none of us allowed for my wayward spirit of invention! You may recall that I started on a tablecloth using a Briggs Transfer, as my “travelling project“. I’ve not travelled much, so progress has been somewhat spotty, but when the weather turned very warm while I was playing with my embellisher, I set the wool aside to pick up the tablecloth. I suppose these might be harebells or bluebells or something similar? 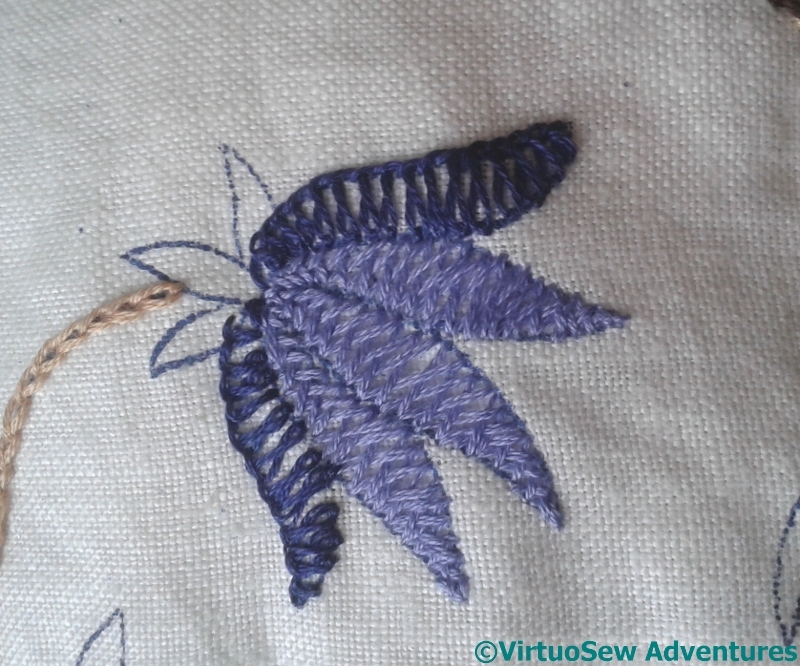 I’ve worked them in Vandyke Stitch, which creates a strong central rib on each petal. 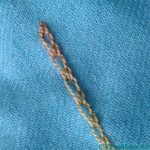 It can be a tricky stitch to get just right, because tension makes a huge difference, and I may have worked them a little too tightly. 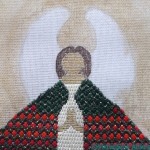 I’ve also changed each of the four appearances of this figure – there are two colours, and the disposition of those two colours isn’t quite the same in any two. It made it more interesting to stitch! The next set of sprigs was this design element, and for this I went very old school and traditional – buttonhole wheels! Furthermore, I used the same idea as with the harebells (if that’s what they are). This time, three colours. The one nearest the stem always dark, the furthest from the stem always light, the other two different on each of the sides of the tablecloth. These two sprigs went swiftly. One heatwave, and they were done. This blueish-purple flower won’t be so quick. 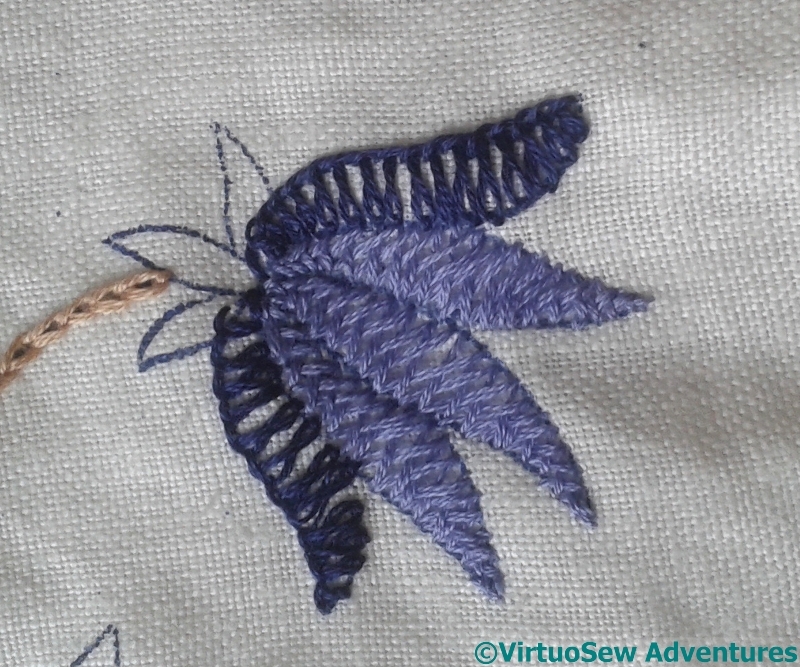 The inner petals are in closed herringbone stitch. 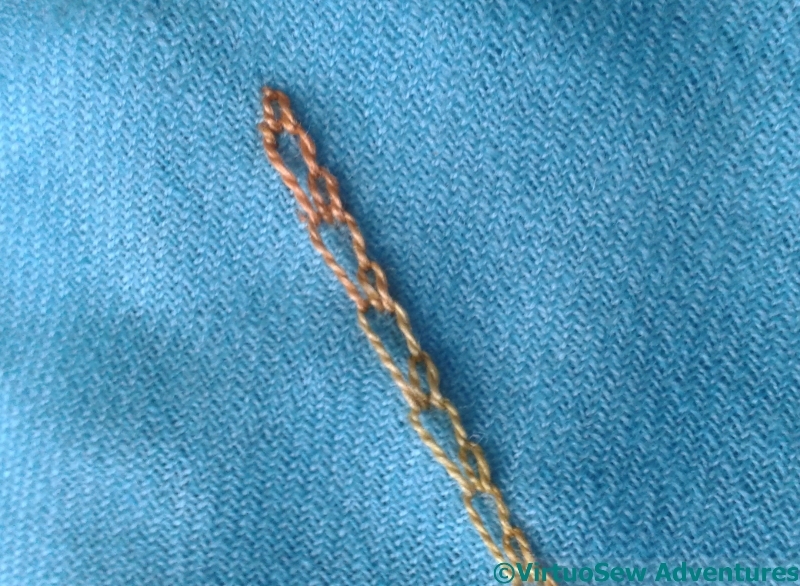 I’m getting better at that, but it is a time consuming stitch and I sometimes tie myself in knots still. 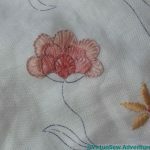 The outer petals are in Basque Stitch, another one that I sometimes tangle. It’s pretty, and creates an intriguing effect. I’ve worked both petals from the base to the time, which produced a few odd contortions. But when it works, I think it’s lovely! 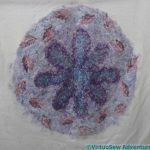 It’s also one of my 17 UFos for 2017 – see Meredithe’s post for more! 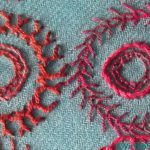 Meredithe (Pomegranate and Chintz) and Anne (Frayed At The Edge) are running a challenge for the year – 17 UFOs in 2017. The idea is not necessarily to finish, but to make substantial progress, on 17 UFOs. Now, I’m not sure I have that many UFOs, and I have many new projects I want to work on (more on those soon), but I do have a good few that are stalled, or that I’m not sure whether I’ve finished or not, so although I’m not going to join in regularly, I will try to use the impetus of the challenge to remind myself to assess progress. 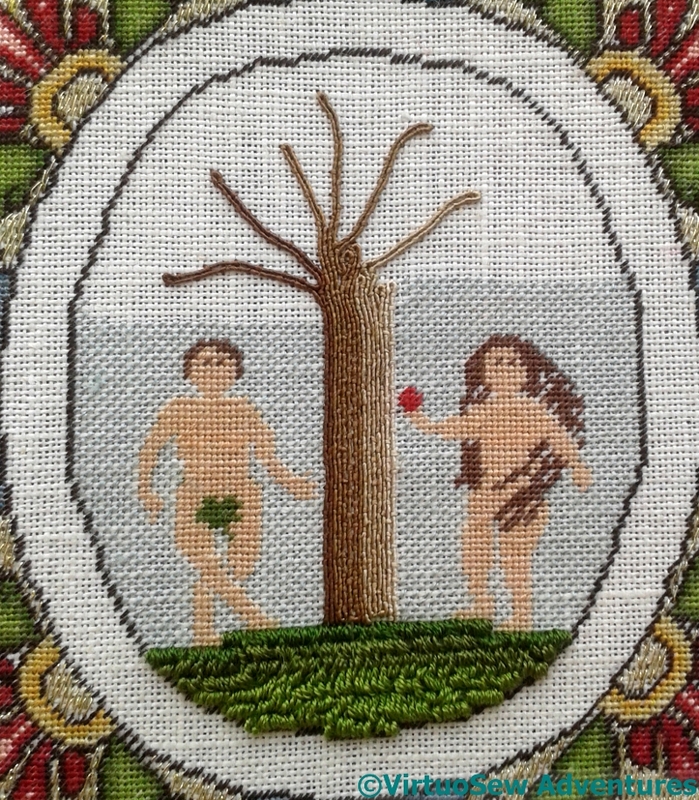 1 Eve in the Garden of Eden – I really want to finish this so I can sign up for the Stumpwork Lion! 2 Nefertiti Shawl – well, clearly, I want to be able to wear this! 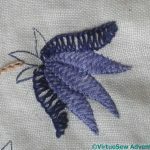 3 Queen Anne style teacloth – this is a travelling project, so it depends on where I go and whether I have light or time to work on it. 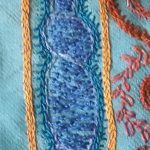 4 The Modern Stitch-Off – I’m not sure whether this is finished or not, so if I can at least decide that by the end of the year, I’ll be pleased. 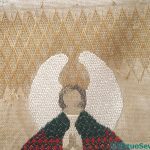 5 The Christmas Angel – I was going to work on the Christmas Angel last year between Christmas and Epiphany, and never set a stitch on it. 6 The Faience Necklace – this has been a real trial to me, as I can’t bring the design into focus. 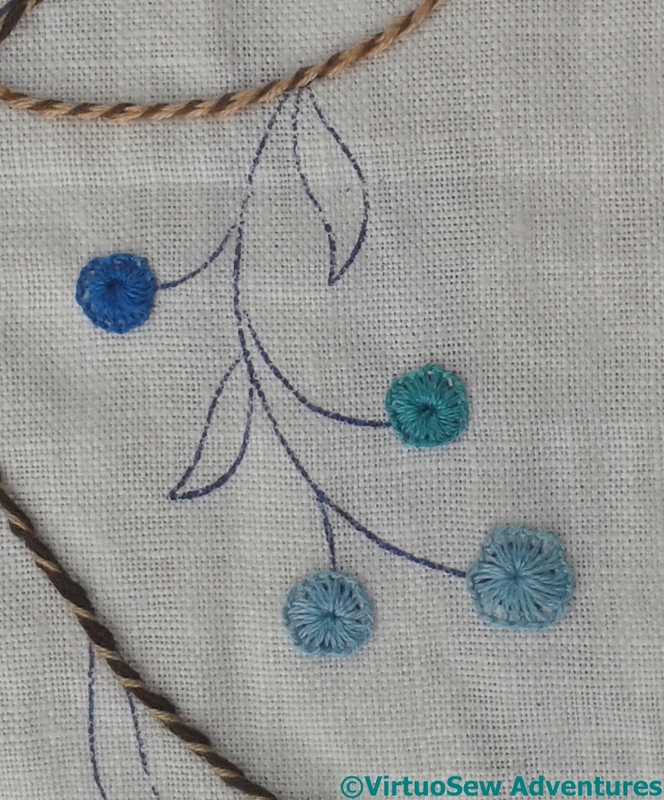 I’ve got some lovely silk thread so maybe that will help me to get started. 8 The Unicorn – again, first layer done, details escaping me. 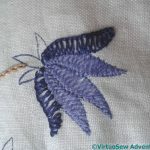 I have a lot of other things I want to do, which are barely begun, never mind finished, and as I have said, in the case of several of these projects it is not a matter of simply stitching, so much as deciding what to stitch, and then stitching it. 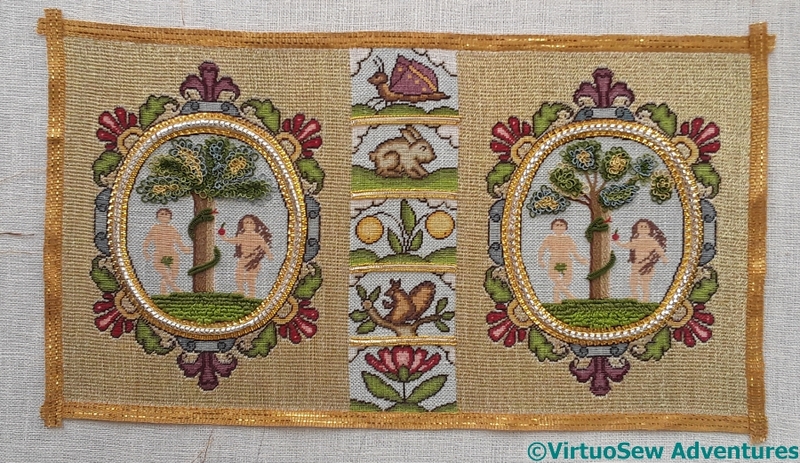 My real target for the year with these eight is to have finished the Nefertiti Shawl and Eve in the Garden of Eden. Anything else is a bonus!